Google Maps comes to Apple CarPlay with iOS 12. Google Maps is now supported by Apple CarPlay, which means that iPhone users can navigate with Google Maps right from their car's built-in display. 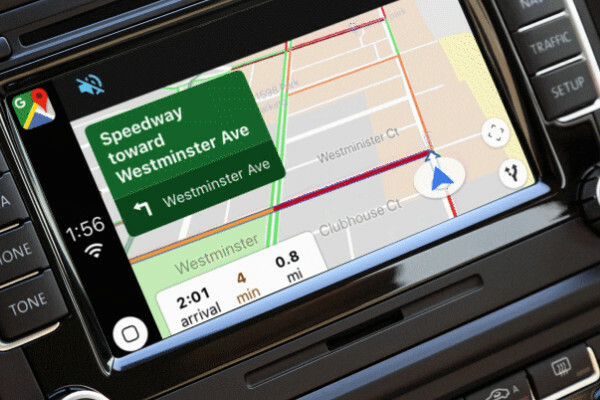 Google Maps is now available to use with CarPlay on all CarPlay supported vehicles and devices globally. To get started, make sure your iPhone is running iOS 12, update your app to Version 5 in the App Store and connect your iPhone via CarPlay. Real time information when you need it: Google Maps on CarPlay features the same navigation experience found in the app. Search for places, see alternative routes and get live, up to date information about traffic jams and delays happening right now. See an up to the minute ETA so you know exactly when you'll be at your destination. Never miss a beat. Google Maps on CarPlay lets you start navigation from your iPhone and immediately pick up where you left off once you've connected to CarPlay. No data? No problem. You can still find your way even if you have spotty reception. You can use downloaded maps of an area so you can see directions and use turn by turn navigation even when you can't get online. Saved lists: You can access any of your saved lists from Google Maps on CarPlay, and quickly navigate to all of your favorite places with a single tap. Save time when commuting: If you've set up your commute within the app, you can quickly navigate to home or work. While en route, you'll see real time traffic updates about your journey so you can be prepared for whatever the ride has in store.